On 5 December 2012, His Holiness Patriarch Kirill of Moscow and All Russia attended a concert of the “Under the Cover of Music” Festival of Vladimir Fedoseyev at the Grand Hall of the Moscow State Conservatoire. Vladimir Fedoseyev, a renowned Russian musician, artistic director and chief conductor of the Tchaikovsky Grand Symphony Orchestra, marks his 80th birthday. In September 2012, His Holiness Patriarch Kirill decorated him with the Order of St. Sergius of Radonezh, 1stclass, in consideration of his contribution to preserving and furthering the traditions of Russian music and in connection with his 80tth birthday. Vladimir Fedoseyev has been a member of the Patriarchal Council for Culture since 2010. That evening, the Tchaikovsky Grand Symphony Orchestra performed pieces by Beethoven, Schubert and Rachmaninov. 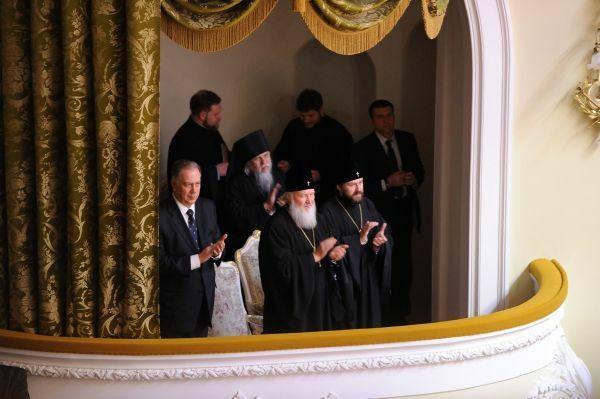 Attending the concert were also Metropolitan Hilarion, chairman of the Moscow Patriarchate’s Department for External Church Relations; Bishop Panteleimon of Smolensk and Vyazma, chairman of the Synodal Department for Church Charity and Social Ministry; Mr. Alexander Sokolov, rector of the Moscow Conservatoire; and other persons, press office of the Patriarch of Moscow and All Russia reports.